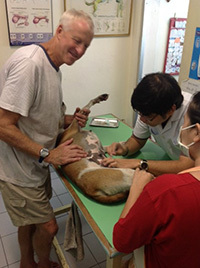 Why for dog in Thailand? The dog situation in Thailand is very sad. The Thai government is turning a deaf ear to the dog meat trade. Too many dogs (Meat) are sent to Vietnam, Korea and China. Dog meat trade is actually the third illegal export of Thailand after drug and wood. 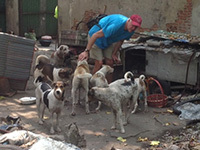 The animal control of PRAWEET in BANGKOK, only catches the stray dogs and send them to UTHAI TANI where the dogs will remain in a shelter for the rest of their miserable life. This shelter has about 8000 dogs living in terrible conditions. 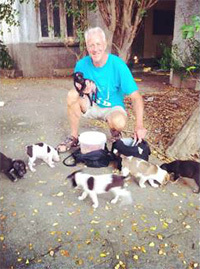 I am happy to work in Bangkok with wonderful rescue people. Together, we try our best to find homes for only a few poor souls. Trying to save one dog at a time!